A good pub with lots of areas for privacy. Welcome rather disappointingly gruff. I agree with previous posters about the lack of choice re the range/styles that Hop Back produce and sad to see their Entire stout or mid-brown Fuggle Stone not on the pumps. Still, as a pale beer lover, it was good try the range back-to-back all the same. Favourites of the night were Citra and Taiphoon. Having for many years hoped to make a trip to this place having espied it from the car, it proved o be no disappointment. It’s where Hopback began and the full range is present and correct including the Winter Lightning which, contrary to expectation, is actually light of hue. A dog, Bundle, sat contendedly drying off in the fire on a very wet day. "Step into my house", you might think as you go in the door, it's just like a house that's been turned into a pub. A complete selection of Hop Back beers served in a friendly atmosphere. Could have stayed all night, but had to go and eat. We did come back again later for more. Lightning and GBF, both very good and £2.55 each. Yes we too were disappointed the Entire Stout wasn't on but the new(?) was a delight. We've been coming here since they first bought the pub and the brewing equipment was being installed in the cellar. 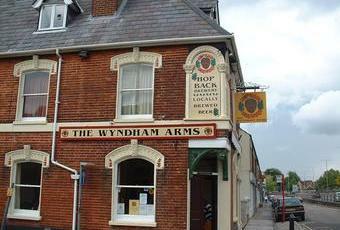 No visit of ours to Salisbury would be complete without a beer at the Wyndham. Another pub that could do with a cheese roll or similar to keep us longer. Great atmosphere (we called in on what was obviously a locals quiz night) and quality beer. It's possibly a little churlish to say that it was a choice of golden ales or golden ales as the Entire Stout wasn't on.